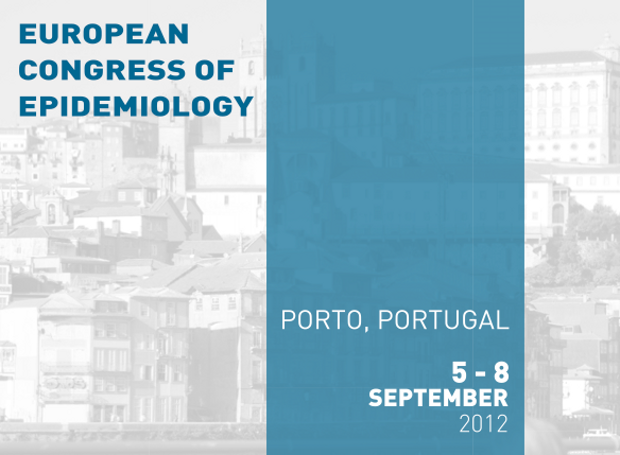 A Unidade de Epidemiologia do IMP-FML apresentou duas comunicações orais e sete posters no EuroEpi 2012 - congresso europeu de epidemiologia, organizado pela Federação Europeia de Epidemiologia, a Associação Portuguesa de Epidemiologia, o Instituto de Saúde Pública da Universidade do Porto e a Faculdade de Medicina da Universidade do Porto. "BELIEFS ABOUT MEDICATION QUESTIONNAIRE: results from its application to a Portuguese cohort of HIV-1 infected adults"
"Disagreement Between Physician Estimates and Self-Reported Adherence to Antiretroviral Treatment in HIV1 Infected Adults"
"Non-adherence to Antiretroviral Therapy Associated Factors: preliminary results from a Portuguese cohort of HIV-1 infected adults"
"Adherence to antihypertensive treatment among African migrants and Portuguese natives: results from a primary care-based cohort study in Lisbon, Portugal"
"HyDia Project – evaluation of a tailored intervention among medicated patients with uncontrolled hypertension, from Lisbon primary healthcare centers"
"Competencies on epidemiological research: methodological details of an ongoing national study about training and education needs"
"Are Diet-related Factors Associated with Differences in Mean Arterial Pressure among Portuguese Natives and African migrants? A Study with Medicated Hypertensive Patients Followed at Lisbon Primary Health Care Centres"
"What is the impact of medication beliefs and illness perceptions on hypertension control and medication adherence?" "Blood pressure control and antihypertensive medication adherence in adult and elder hypertensive medicated patients in primary health care in Lisbon region"
O Congresso europeu de epidemiologia realizou-se de 5 a 8 de Setembro na cidade do Porto.